Meet NAO, a humanoid robot therapist who’s making amazing headway with treating children with ASD (Autism Spectrum Disorder). This friendly little robot is capturing attention worldwide, and he’s as popular with parents as he is with children. Since many autistic children have a noted aversion to human faces and don’t pick up on non-verbal cues, there can be significant delays in the development of their communication skills. Before children learn how to speak properly, to express their needs, they communicate with what is referred to as joint attention: pointing, gesturing, and signalling the importance of something by making eye contact with the person whose attention they’re trying to get — and then glancing over at the item in question. Joint attention is of significant importance when it comes to communicating and interacting with other people, and also influences our ability to learn languages, as gestures and non-verbal expression are integral to understanding the meaning of words and phrases. The mechanical engineers and autism experts at Vanderbilt University in Tennessee have found a way to work around this issue, with NAO (pronounced “now”), the friendly robot that can stand on a table with its face at a child’s eye-level, encouraging him to mimic gestures and follow simple directions. Researchers have discovered that autistic children pay far more attention to a robot therapist than to a human one, which can open some great new doors as far as assisting kids with their communication and coordination. 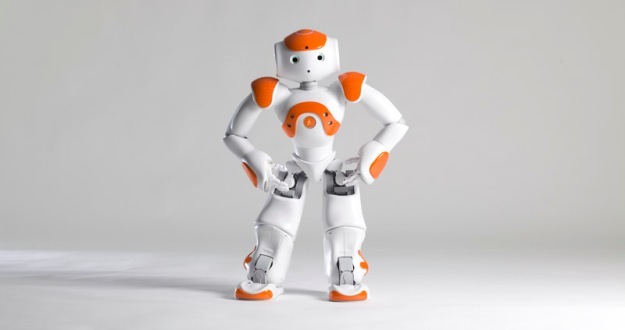 NAO was programmed with the same types of gestures and verbal prompts that therapists use, and via a system of cameras, sensors, and computers, NAO can adapt his behavior according to how each individual child responded to him. A training exercise was conducted with a dozen children ages 2 to 5: half of them were on the autism spectrum, and half were not. 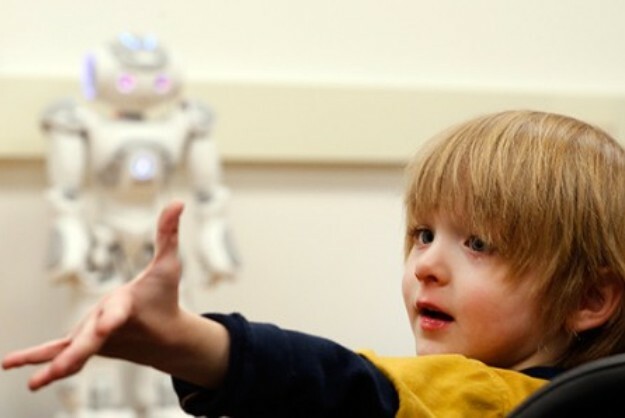 The researchers found that all of the children spent more time watching the robot than they did a human therapist. NAO isn’t just cute, he’s engaging and encouraging, praising each child by name for a job well done when they’ve followed a gesture or suggestion correctly. Capturing a child’s attention is critical for early intervention treatment, and being able to teach joint attention techniques and responses to autistic children while they’re very young can be of immense help in their treatment and personal development. “This is the first real world test of whether intelligent adaptive systems can make an impact on ASD,” said team member Zachary Warren, who directs the Treatment and Research Institute for Autism Spectrum Disorders (TRIAD) at Vanderbilt’s Kennedy Center. Vanderbilt Professor of Mechanical Engineering and Computer Engineering, Nilanjan Sarkar, first conceived of this project after visiting his cousin in India several years ago. While there, he learned that his cousin’s son had been diagnosed with ASD, and as he learned about autism, it occurred to him that his research could be valuable in its treatment. Sarkar developed systems to improve the man-machine interface by outfitting the computer/robot users with biosensors that could analyze variations in blood pressure and skin response readings in order to evaluate the subjects’ emotional and monitor their responses. This allowed the computers and robots to then respond according to each individual subject. There’s a saying among therapists who work with autistic kids: “If you’ve met one child with ASD, then you’ve met one child with ASD.” Autism manifests differently in every single child, and having a therapist who can adapt to individual needs, and also make contact on a level that a human might not immediately be able to reach, is both astonishing and encouraging. 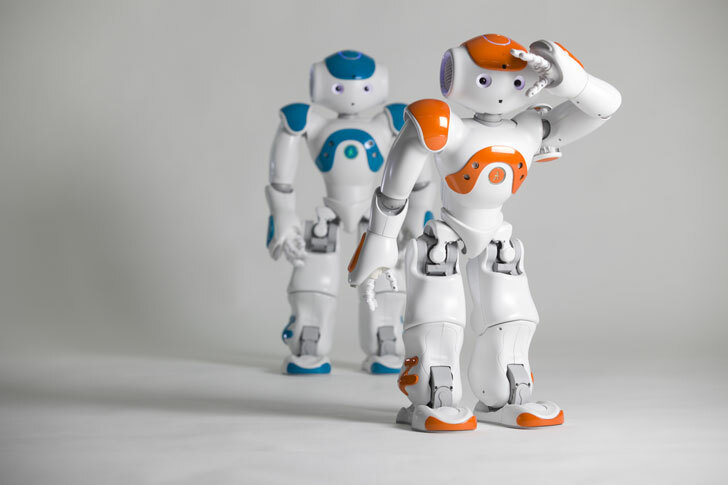 Robots like NAO would not replace human therapists, but would be a treatment tool that therapists could use in tandem with their own work with autistic kids — one that could ease many of the difficulties that children with ASD struggle with, and help both their coordination, and their ability to communicate more effectively. Meet NAO, a humanoid robot therapist who's making amazing headway with treating children with ASD (Autism Spectrum Disorder). This�friendly little robot is capturing attention worldwide, and he's as popular with parents as he is with children.